Mile End is just one of many businesses hit hard by Sandy (their baking and smoking facilities were submerged in under four feet of water). 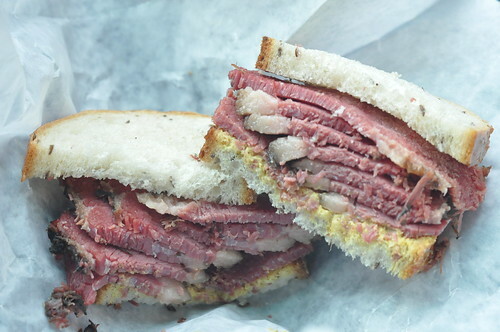 The smoked meat on rye with mustard rings in at $14. It's not huge. But it is delicious and worth the splurge for those who love deli. Right now through Sunday they are serving surf 'n' turf latkes for Hanukkah. According to Eater, that involves two latkes "topped with chopped liver, gribenes, and pickled eggs, and the other has trout roe and whitefish salad." And they're also taking reservations for their "traditional" Jewish Christmas spread on 12/24, 12/25, and 12/26. Jewish Christmas, for the uninitiated, is traditionally Chinese food because those are the restaurants typically open on Christmas Day--Dan Dan Noodles with Spicy Lamb! BBQ Duck! Smoked Bluefish Toast! If you're interested, don't delay, they have limited seatings and I'm sure the reservations are going fast.